South Africa’s water security depends not only on our built water infrastructure, but also on well managed land in our catchments. Healthy wetlands, rivers and groundwater ecosystems in the landscape will make our future more water secure. They are ecological infrastructure that can generate and deliver significant improvements in water quantity and quality if we look after them. Investing in ecological infrastructure in conjunction with built infrastructure, will deliver more clean water from our land. Clean water supports food production, access to improved drinking water and sanitation and is fundamental to South Africa’s economic growth. Investments are particularly important in our strategic water source areas where ecological infrastructure assets are under-protected and slowly, or sometimes rapidly degrading. There is an urgent need to bring investment in the management, maintenance and restoration of ecosystems into the planning, financing and development in the water sector. Such investments will create more jobs and advance our nation’s developmental agenda, especially in face of changing climate. This is what the Ecological Infrastructure for Water Security Project aims to address. It will transform the way people think about, value and invest in water and ecosystems, and will lead to increased investment in the management of ecological infrastructure in the future. 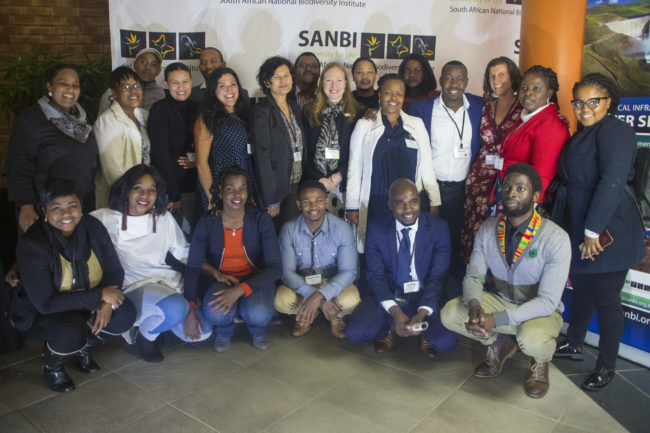 The project was launched on the 31 May 2018 at the Development Bank of Southern Africa (DBSA). 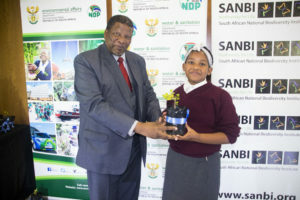 This five year investment of USD$7.2million (R90 million) from the Global Environment Facility (GEF), together with considerable in-country co-finance, has the Department of Environmental Affairs as the national focal point and the DBSA as the Project Implementing Agent for the GEF in South Africa. SANBI is the project executing agency. Designed in close consultation with the Department of Water and Sanitation (DWS), the project will support the implementation of the National Water Resource Strategy and it is included as part of the Call to Action in the draft Water and Sanitation Master Plan. 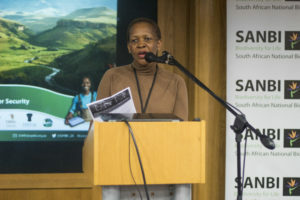 Project implementation will be through a suite of partnerships involving several other public, private and civil society organisations, such as the DWS, the Water Research Commission and WWF-SA. Speaking at the launch event, the Minister of Water and Sanitation, the honourable Mr Gugile Nkwinti, emphasised the need for collaboration in initiatives of this nature as well as capacity development particularly around good governance. He also encouraged leaders across government sector to have more dialogues of this nature and use them as platforms to effect social transformation enhanced by quality research, development and innovation. Other speakers, including during the panel discussion, lauded the responsiveness of this project to various national development strategies and plans that relate to sustainable development within the domestic and global context. This project aims to integrate biodiversity and ecosystem services into development and finance planning. This will be achieved through policy and capacity development incentives for mainstreaming biodiversity and ecosystem values into national, regional and local development policy and finance in the water sector. This project will be piloted in the Berg-Breede and the Greater uMngeni catchments which were selected through a rigorous prioritisation process. The two catchments are home to two of the largest cities in South Africa namely Cape Town and Durban with about 16 million people combined. The intervention of this project will also include transformation of people’s behaviour around utilization, valuing and investment in water and ecosystems. This includes unlocking opportunities for increased financial flows into the management of ecological infrastructure in a manner that creates jobs, reduce poverty and address inequalities. In a nutshell, South Africa’s water security is derived from a combination of built water infrastructure and a well-managed land in respective catchments. Thus, the improvement in the quality and quantity of water is enhanced through maintenance of healthy wetlands, rivers and groundwater ecosystems in the landscape.